We only have one body and this is our vehicle to allow us to do what it is in our life. Self care is just so important, especially as our body houses our spirit and if spirits are low then our body doesn’t feel great. When you have regular self care practices you will feel calm and balanced, allowing you to do the things in your life you really want to and you will also enjoy looking and feeling radiant and glowing. We offer the best in services for your body at Hot Locs. As you step into the spa side of the salon you will feel an instant calm come over you as the delicious smells of essential oils and the warm soy candles envelop your very being. La Clinica Age Reversal offers a series of high strength skin peels and treatment products to promote deep exfoliation and peeling for skin rejuvenation. This exclusive customized facial is personalised just for you by our highly trained therapists. Using La Clinica products to meet your skin’s every need on the day of your treatment. This deluxe facial uses every product we need to make your skin look and feel amazing, to give to ultimate result. This is by far our most loved facial. A beautiful appearance is always yours with Mineralogie but we take beauty one step further. The signature Loose Mineral Foundation benefits your skin by protecting it from the sun’s harmful rays and is full of antioxidants such as vitamin A & E, which shield your skin from pollutants and keeps your complexion youthful and fresh. With our extensive range of body treatments, using the devine La Clinica product with the most natural and organic ingredients. We have a body scrub/wrap tailored for your individual needs. 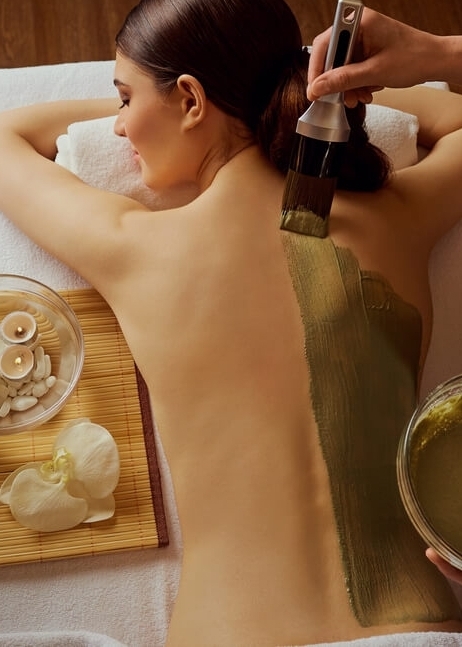 From a detox mud wrap using deep sea minerals to the cocooning tropical spa healing wrap with macadamia and honey, leaving you feeling recharged and revitilized in every way. Our makeup is that of pure luxury and contains the purist minerals, containing no talc or perfumes. It undergoes a milling process 3 to 4 times to create the silkiest of bases. Mary Van who created makeup for the makeup artists of the Hollywood stars has developed the Mineralogie range as her own. These products are amazing for photos and create a beautiful warm glow. Either allow us to do your makeup professionally for an event or even corporate photos or purchase products to use at home. For special events, we can arrange a hair and makeup package to have you looking and feeling amazing. Includes a skin consultation, customised facial, half hour massage of your choice, foot spa and light refreshments. Includes a skin consultation, customised facial, full body scrub and massage, full deluxe spa manicure or pedicure, foot spa and light refreshments. Includes a skin consultation, customised facial, body treatment of your choice (from our body menu), full body scrub and massage, full deluxe spa manicure and pedicure, foot spa and light refreshments. From waxing and tinting to body wraps, facials and body healing techniques, Hot Locs have it all sorted for you to not only look great, but feel the tension dissolve from your body the minute you enter our beauty zone. Our treatment rooms are filled with calming aromas and you can simply enjoy being made to feel amazing by your professional therapist.